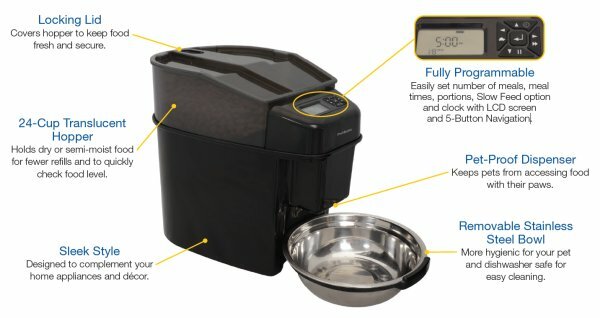 Convenience for you, Healthy for your pet - Say goodbye to early morning wake-up calls, guessing if your pet has been fed and the daily chore of pet feedings! 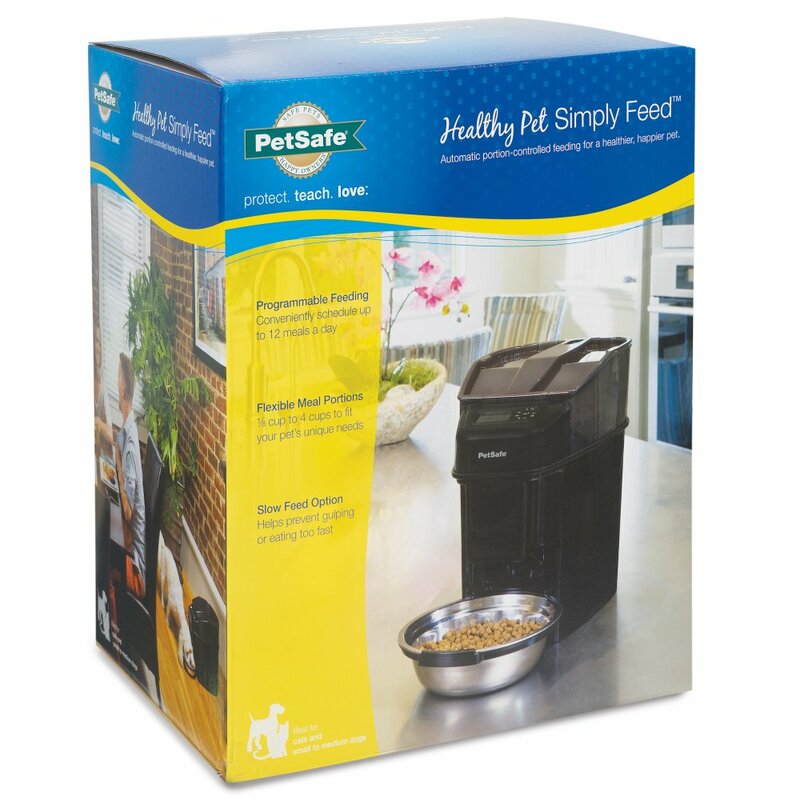 Fully programmable, the Healthy Pet Simply Feed is a convenient, stress-free way to feed your pet and simplify your life. 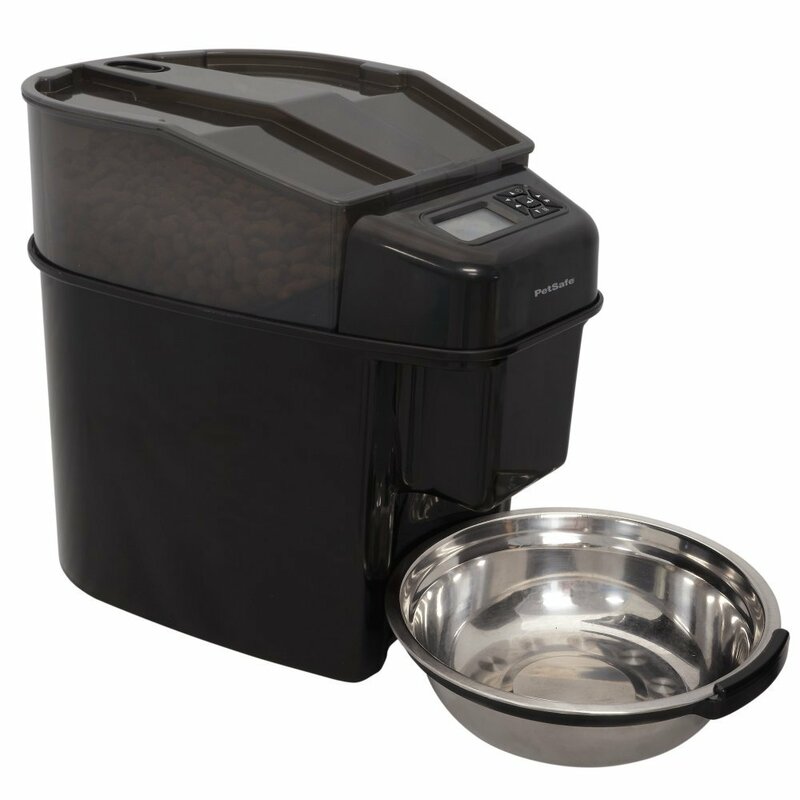 It automatically feeds your pet per the portion and schedule you set whether you are asleep, at work, or away. 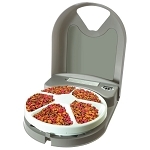 With its sleek style and advanced features, the Healthy Pet Simply Feed design keeps both you and your pet in mind. 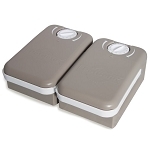 An innovative conveyor dispenses most dry and semi-moist foods for best portion-control and accuracy, while the pet-proof dispenser keeps your pet from accessing the food. 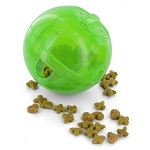 The unique Slow Feed option is a perfect solution for a pet that eats too fast, helping prevent bloat and vomiting. 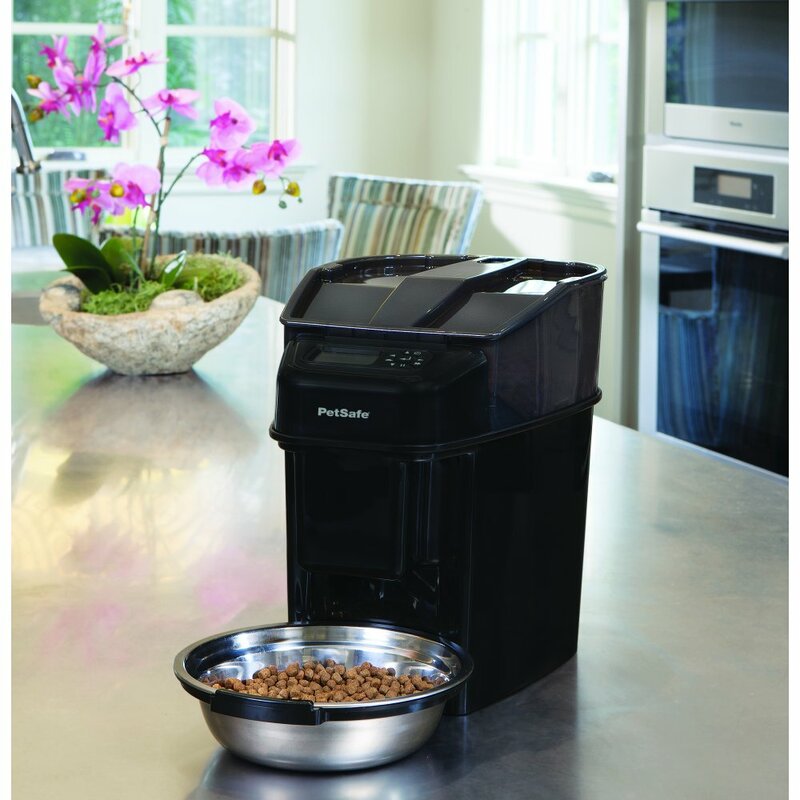 Fewer refills are needed with the 24-cup capacity hopper. Dishwasher safe parts make clean-up quick and easy, giving you more time to spend with your pet. 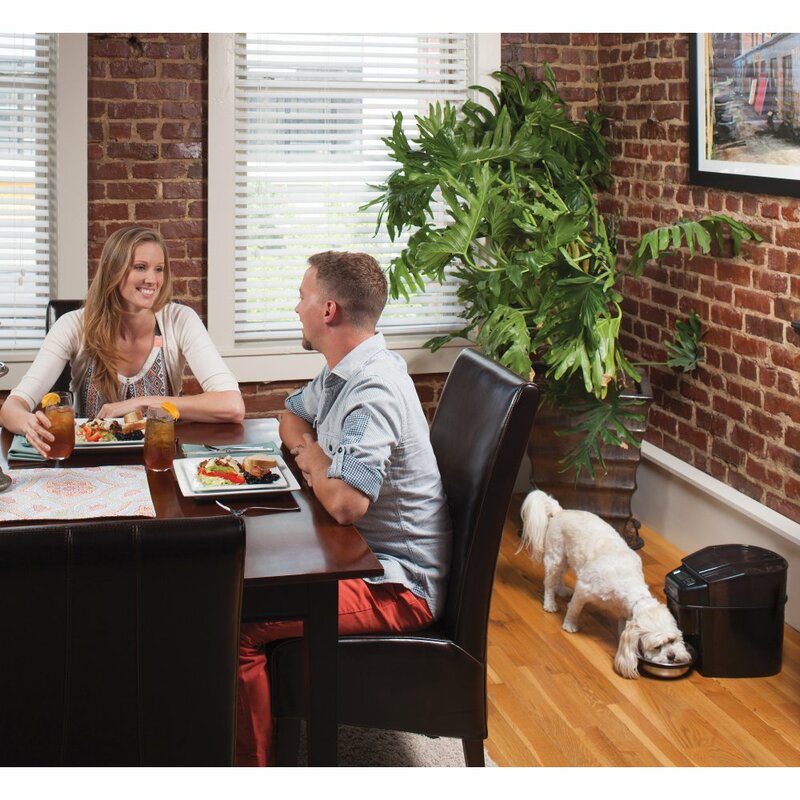 Offering custom meals to fit your pet's specific needs, the Healthy Pet Simply Feed provides peace of mind your pet is fed wherever you are all while complementing your home decor. Ideally by working with your veterinarian, it also helps with proper weight management by automatically giving your pet the portioned feedings they need and consistent routine they crave resulting in a healthier, happier pet! My cat is food obsessed and obese. I have him on a vet recommended diet but he would harass me all day to feed him. I got him this feeder because other people with the same problem said the feeder helped. It has been amazing so far. I thought it was really easy to progam. People have complained about this on other reviews and I thought the directions explained it very well. He is not as obsessed with food anymore because of the schedule throught the day. He also does not wake me up a 5am to feed him. When the food dispenses the food the bowl makes a loud noise but it's really not a problem. 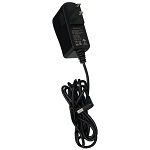 Overall I love this product and would highly recommend it. I've been using this for about 2 straight weeks and couldn't be any happier. No problems at all. Read A LOT of reviews before purchasing..... This just made sense to try after reading them. And btw, whoever says that setting the meal times/amounts is hard must have a lot of trouble in life because it's not difficult AT ALL. Smh. Totally worth what I paid and if yours doesn't work correctly, you must have gotten a bad one (that happens sometimes on assembly lines). At first I thought I would replace the metal bowl that it comes with but I actually like that the cats can hear the food dropping into it, sends them running for it, lol. Also, the cats haven't had any episodes of throwing up from not getting fed on time. Loving it! We previously returned a feeder (another vendor) that we spent close to $100 on. It became erratic in very short time. Also, our cat could coax food out of it. So we researched some more and found this one. Have only been using it for about two weeks, but So Far, So Good. We hope the good performance continues. As I said when I ordered it, we purchased from You because you seemed to stand behind your product. Crazy to spend so much money to get a reliable feeder but, if it continues to be reliable, we will be happy. Worth the price, easy to program if you go through the instructions. My cat is a food addict and tried to get into any automatic food dispenser and was successful but no luck at all with this one. There is no way she can put her grimy little paws up to receive food or push it hard enough to receive a few morsels. Because of this work of art, my husband and I can go to sleep early without our cat freaking out that she wasn't fed yet (granted, it took a few days for her to catch on that she would always be fed no matter what with this dispenser) and we can finally sleep in. The fact you can set the time has worked wonders, she doesn't associate waking us up and meowing earlier and earlier each morning with getting food. When it dispenses, it does make a loud clanging sound but she associates that with her feeding time instead of us getting up to feed her. It truly has changed our lives and helped us to get longer and more quality nights of sleep. A really nice auto feeder and nice quality. Programing takes a few minutes to understand, but then goes easily. Has all the features I wanted and now just sits there and works. Best price was right here at RadioFence. I ordered this feeder for some outdoor cats and found it to be a good design for indoor cats. However, once I had assembled it and set it up, I read near the end of the instructions that it was not to be used in temperatures below 40 degrees. Since I live in a cold climate that eliminated it as being useful for me.